The solution blocks the new breed of sophisticated attacks that target Multiple layers of the IT infrastructure . Today's point security tools for IT infrastructures are not enough to protect against the new wave of sophisticated cyber attacks. That's why Radware (NASDAQ: RDWR), a leading provider of application delivery and application security solutions for virtual and cloud data centers, today announced Radware Attack Mitigation System (AMS), the industry's first fully integrated IT security strategy and portfolio that protects the application infrastructure in real time against network and application downtime, application vulnerability exploitation, malware spread, information theft, Web service attacks and Web defacement. Available today, Radware's AMS provides the most comprehensive solution to fight multi-vulnerability campaigns — today's sophisticated, headline-grabbing cyber attacks that probe IT targets for weaknesses and strike with parallel assaults across the infrastructure. These attacks are hard to defend against because they are aimed at multiple layers in the IT architecture, particularly against network infrastructure equipment, servers and applications. Examples of multi-vulnerability attacks include high-volume distributed denial of service (DDoS) attacks as well as "low & slow" stealthy attacks, network- and application-based attacks, all of which hit simultaneously at multiple weakness points in the networks while emulating legitimate user behavior making them harder to identify and block. "The major advance in new threats has been the level of tailoring and targeting — these are not noisy, mass attacks that are easily handled by simple, signature-dependent security approaches. Targeted attacks aim to achieve a specific impact against specific enterprises, and have three major goals: Denial of service -- Disrupting business operations; Theft of service -- Obtaining use of the business product or service without paying for it; and Information compromise -- Stealing, destroying or modifying business-critical information," according to John Pescatore, VP Distinguished Analyst, Gartner, Inc. "Enterprises need to focus on reducing vulnerabilities and increasing monitoring capabilities to deter or more quickly react to evolving threats, and not focus on what country the attacks are coming from. " Organizations typically respond to these attacks with separate patches and tools for protection such as anti-DoS, intrusion prevention systems (IPS), Web application firewalls (WAF), network behavioral analysis (NBA), reputation engines, and security information and event management (SIEM) solutions. Radware AMS consolidates these multiple attack detection with mitigation technologies, such as signature detection and network and application behavioral analysis (NABA), to handle malicious application traffic through application-level challenge/response techniques. This gives security managers the ability to identify bots that imitate real user application transactions and block them in real time, avoiding the need to perform rate-based protection that would drop legitimate users along with the attack traffic. "Nearly all IT security solutions today are designed and deployed as point solutions. That's the problem — they miss the big picture," said Avi Chesla, Chief Technical Officer for Radware. "Thus they cannot make the required context-based security assessment, leaving the network exposed to today's multi-vulnerability attack campaigns. "Most vendors only specialize as players in a primary solution – providing only WAF, IPS, DoS protection, or network behavioral analysis. Others will offer 'light' version add-ons to incorporate additional defenses. The solution we have launched offers best-of-breed technologies for all of these security modules in a holistic, integrated solution addressing the full gamut of today's evolving security threat landscape. Recent cyber attacks prove that businesses need to plan for the worst case, and that plan mandates the use of Radware's AMS solution," Chesla said. The ultimate impact of multi-vulnerability attacks on businesses can be staggering, resulting in fraud, defacement, identity theft, leaking of sensitive corporate information, and as seen in many cases over the past year, a complete shutdown of operations. Yet as hackers evolve in sophistication, so too must IT security managers evolve their thinking. Radware AMS can lead a transformative shift in the way the industry approaches IT security from the current, tool-based response to a holistic approach that integrates tools and strategies into a real-time, proactive, attack mitigation solution. Designed for online businesses, large enterprises, carriers, data centers and managed service providers, Radware's AMS is built on Radware's award-winning DefensePro® network security appliance, AppWall® Web application firewall and APSolute Vision® application and network security management dashboard. Radware supplements these capabilities by adding the human factor — the professional security consultants of its Emergency Response Team (ERT) who are available around the clock. As literal "first responders" to cyber attacks, Radware's ERT members gained their extensive experience by successfully dealing with some of the industry's most notable hacking episodes, providing the knowledge and expertise to mitigate the kind of attack a business's security team may never have handled. In support of the announcement, Radware is launching its new company blog, which features expert insights on not only security, but also application delivery, mobile data, virtualization, service provider issues and a host of other IT topics. The company is also running a global marketing and advertising campaign to educate end users on how they need to be fully equipped to overcome today's multi-vulnerability attacks and take an offensive posture. The campaign features a Flash game and contest designed to provide players with a fun way to learn about Radware's Attack Mitigation System capabilities while they understand how to cost-effectively neutralize today's distributed attacks. The game, "Radware AMS Threat Race", runs until mid-October and offers contestants the opportunity to win $5,000. For more information and game access, please visit: http://www.radware.com/ams. 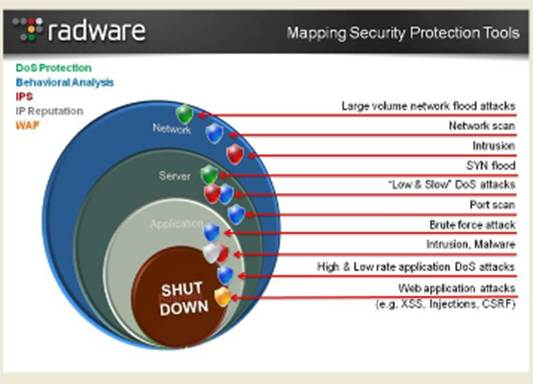 For more information on Radware's AMS, go to: http://www.radware.com/Solutions/Enterprise/Security/default.aspx.